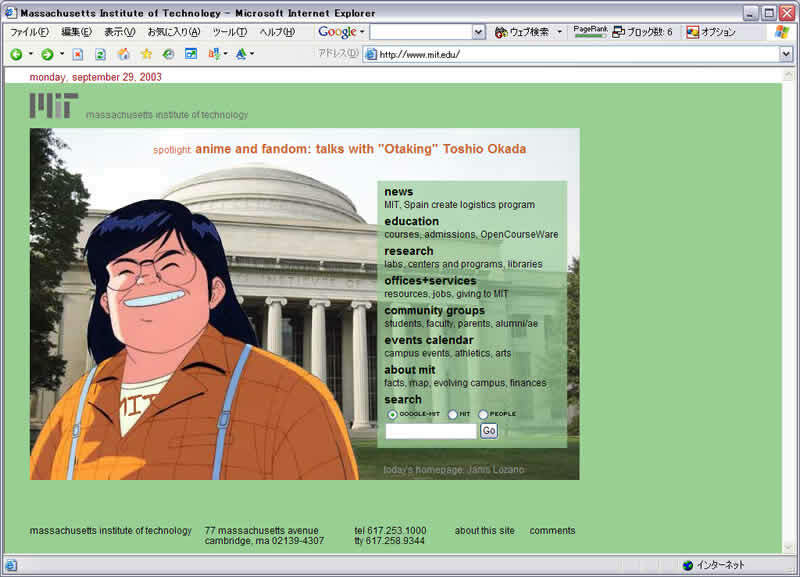 The Otaking Does the (Anime) Blog Diet and Wins! But now he looks like this! He used to post images of all the food he ate to his blog but got alot of comments saying he was eating way too much. He estimates he took in as many as 4000-4500 calories a day at the high point….He says he realized that by overeating he was gambling with his body and by decreasing his weight he would win. Therefore Okada made a conscious investment in what he ate and drank from a ceratin point and set a goal of consuming only 1500 calories a day. See? The moral of the story is: leaving comments on a person’s blog can change his life! Nudge nudge, wink wink, say no more. One of his techniques included cutting a Mega Mac into 4 segments, eating only 1 and throwing away 3 of them. For reference, this is a Mega Mac. A quarter of it isn’t nothing! It’s basically a Big Mac with double the meat. It has 750 calories and 46 grams of fat (source). It is not sold in the United States, because it would probably get some sort of FDA sanction for rapidly inducing heart failure. 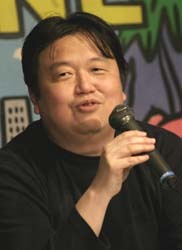 Okada was the inspiration behind the character of Tanaka in Gainax’s 1992 OAV, Otaku No Video. 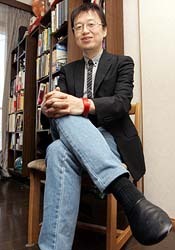 That was his last production as a Gainax staff member; IIRC he is now a visiting professor at a university now. Previous PostClaymore 23 review pt. 2- the Defining and the application of the Shonen ThesisNext PostSchool Days 10: A Return to Form? Throw away? Damn wasteful mother fucker. Just eat it on the free day, and eat healthy for the rest of the week and try to get some exercise! 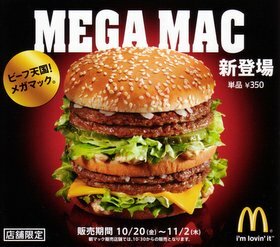 I don’t think the FDA would object if McDonald’s were to start selling Mega Macs over here–IIRC, Hardee’s sells a burger with over 1000 calories without facing any sanctions. It’s probably more of a PR thing, since they’ve been trying to project a more health-conscious image lately. It seems to have been a limited-time thing even in Japan, as there’s no longer any mention of it on their website. Could a person even take one bite out of that Mega Mac without it falling apart? I have enouh trouble with a regular big mac, lol. Adun – well, it’s difficult but technically doable. It’s just that the sauce and some lettuce get on my hands. Andrew F. – yeah, it’s a temporary thing for a promotion. Because normally Asians can’t eat a lot. @rayyhum777: that’s what I do! Or, I eat a big lunch, and I don’t eat dinner or only a protein shake. That also works pretty well. @Andrew: of course they wouldn’t really ban it, not when not only there are 1000+ calorie burgers but Chipotle burritos that are 1400 calories. Despite their increased lines of salads and the like, I think McDonald’s has to realize that no amount of advertising is going to change the fact that are what they are–the ultimate symbol of fatty American excess! They should just embrace it. @Adun: Indeed. I suppose it’d be too classy of them to stick a toothpick or two. Though, does anyone remember the Bennigan’s Big Irish burger? A one pound patty with a steak knife through it? Now THAT’s hamburgertastic!